Mainbocher, 1949 collection: satin gown. sketchbooks, Costume Institute at the Metropolitan Museum of Art. Died: 27 December 1976. Levin, Phyllis Lee, The Wheels of Fashion, New York, 1965. Lee, Sarah Tomerlin, editor, American Fashion: The Life and Lines of Adrian, Mainbocher, McCardell, Norell, and Trigére, New York, 1975, 1987. 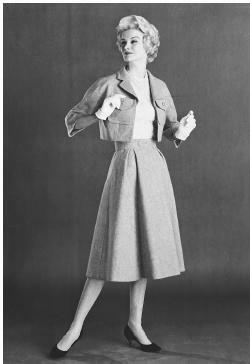 Mainbocher, spring 1958 collection: wool suit with a halter top of lace over shantung. "Mainbocher," in Current Biography, February 1942. "Mainbocher," special monograph issue of Harper's Bazaar, July 1967. "Mainbocher: Great Gentleman of Fashion," in Harper's Bazaar, June 1971. "Mainbocher," [obituary], in the Times (London), 5 January 1977. "The Career of Mainbocher Discussed," in the Times, 14 January 1977. Lawford, Valentine, "A Look Back in Fashion," in Architectural Digest (Los Angeles), September 1988. Cunningham, Bill, "An Elegant Blast From the Past," in the New York Times, 24 September 2000. The snob appeal of patronizing an American couturier with a French sounding name—extremely successful in Paris for a decade before his arrival in the United States—appealed to the socially élite trade in 1940 New York. No less appealing was the fact that Mainbocher had designed the Duchess of Windsor's trousseau upon her marriage in 1937. In 1930, after several years as editor of French Vogue, Mainbocher suddenly decided to channel his artistic sensibilities into the establishment of a couture salon in Paris. Editorial experience enabled him to sense what would become fashionable and to package himself as an exclusive designer to the wealthy and the titled. From the start, Mainbocher specialized in simple, conservative, elegant, and extremely expensive fashions, the luxury of cut, materials, and workmanship that could only be recognized by those in the know. Most importantly, the clothes, exquisitely finished inside and out, gave self-confidence to the women who wore them. Mainbocher considered his contemporary Chanel too plebeian, and Schiaparelli too avant-garde. Instead, he admired Vionnet and borrowed her bias-cut technique for his own simple slip evening dresses in the 1930s. Twenty years later, a very similar slip design was employed by Mainbocher, produced in a signature elegant silk velvet fabric. From Augustabernard, another 1920s French dress designer, Mainbocher was inspired not only to form his name, but to use godets in skirts, and shoulder bows to catch the folds of draped bodices. Frequent Mainbocher suit treatments in the 1930s included short capelet effects or dropped shoulders widening into full sleeves. The designer knew his clientéle personally and designed for the lives they led, specializing in evening clothes. For resort wear he ventured into a mix-and-match ensemble consisting of matching top, skirt, bathing suit, and hat. Slim, demure black wool dresses for daytime would sport white chiffon interest at the throat. While Mainbocher did use some Japanese-like kimonos as eveningwear during this period, his hallmark was nonaggressive, not exaggerated or period dressing. A touch of labor-intensive luxury would be bestowed by all-over sequins on an evening jacket or on a bare top worn discreetly under a jacket. The grayish-blue, "Wallis blue," of the Duchess of Windsor's wedding dress, as well as the long, fluid crêpe dress itself, was widely copied. The simple, conservative elegance of Mainbocher's style, feminine but not fussy, perfectly suited the slim, severe good looks of the Duchess and wealthy women like her. Additionally, she was honoring a fellow American. 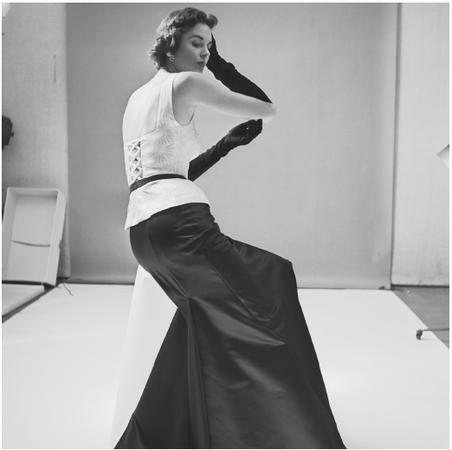 In 1934 Mainbocher introduced the boned strapless bodice, and before the war forced him to leave Paris, a waist cincher, forming tiny waisted, pleated and skirted dresses that presaged Dior's postwar New Look. Mainbocher's arrival in New York coincided perfectly with the city élite's love for French couture, for though he epitomized it, he satisfied their patriotism because he was actually an American. Society matrons such as C.Z. Guest and the Vanderbilts, and stage actresses such as Mary Martin, avidly patronized this "most expensive custom dressmaker" who made women look and feel exquisitely well-bred. Accedance to wartime economies resulted in Mainbocher's short evening dresses, and versatile cashmere sweaters—beaded, lined in silk, and closed by jeweled buttons—designed to keep women warm in their bare evening gowns. Another practical wartime innovation, the "glamor belt," an apron-like, sequined or bead-encrusted accessory, could be added to embellish any plain costume. Practically gratis, Mainbocher designed uniforms for the U.S. Women's Marine Corps, the WAVES (Navy), the American Red Cross, and the Girl Scouts. As the years progressed, Mainbocher continued to design exclusively on a made-to-order basis, refusing to license his name. La Galerie, a department in his salon, did produce clothes in standard sizes, a compromise for busy women without time for lengthy fittings. The reverse snobbery of the humble pastel gingham or cotton piqué used for fancy dresses appealed to Mainbocher's clientéle, as did refined tweed suits with subtle dressmaker touches such as curved bands or fabric appliqués, worn with coordinating bare-armed blouses. A Mainbocher standby was the little black "nothing" sheath dress. By the 1950s and 1960s, old guard Mainbocher customers enjoyed wearing impeccably made classic coats and suits of wool, often fur-lined, in the midst of nouveau-riche ostentation. The typical ladylike daytime Mainbocher look was accessorized by a plain velvet bow in the hair instead of a hat, a choker of several strands of real pearls, white gloves, and plain pumps with matching handbag. The integrity of luxurious fabrics, intricate cut, quality workmanship and materials, elegance and classicism, were cherished and worn for years by Mainbocher's upper crust customers. Mad Carpentier Malden Mills Industries, Inc.